Sharing the news of your new arrival couldn’t be easier with Kathy Hodson’s DIY Birth Announcement card. This is ideal for sending to your eagerly-awaiting loved ones to tell them that your bundle of joy has arrived! Friends and family will be so excited to learn the name, weight and appearance of your new baby, and with Kathy’s simple step-by-step you can create this beautiful card in no time. Whether you make a number of these to send to your loved ones, share an image of your finished project on social media to welcome your little one into the world, or even frame this project to create a piece of wall art to treasure, this is a wonderful craft to celebrate your new baby. For this project, we’ve used First Edition’s latest collection, Hey Baby. As well as featuring a range of adorable illustrations, this paper pad has a gorgeous array of pastel colours, perfect for the announcement of a little girl or little boy! 1.Cut three rectangles from different paper from the Hey Baby paper pad measuring 15cm x 20cm, 14cm x 19cm and 13.5cm x 18.5cm. Mat and layer these largest to smallest. 2. Cut three squares measuring 5cm and a rectangle measuring 6.4 x 17.2cm from a fourth paper from the pad. Layer on top of the other rectangles with the squares on the right hand side. 3. Using Microsoft Word, or a similar text package, create a text box measuring 16.6cm x 5.8cm. Type ‘Introducing’ at the top of the text box. Leave a gap measuring at least 9cm. This will be enough to add in the tag shape. Type the rest of the details, including the birth date and the baby’s weight. I also added the line from the poem about the days of the week the child was born (alternatively, you could use an alphabet stamp set to create your text). Print and fix onto the small rectangle. 4. Print and cut three images of the baby measuring 4.5cm square. Layer the photographs onto the square papers. 5. Cut one of the tags from the topper sheet in the pad and add the baby’s name. Fix on top of the printed details with foam pads. 6. Cut the ‘Bundle of Joy’ banner from the topper sheet inside the paper pad and fix on top of the tag using foam tape. 7. Add a bow on top of the tag and add fussy cut shapes from the papers within the pad to complete the new baby announcement card. You now have your finished Birth Announcement card! So perfect for announcing a little one’s arrival, this is such a wonderful make to treasure for years to come. 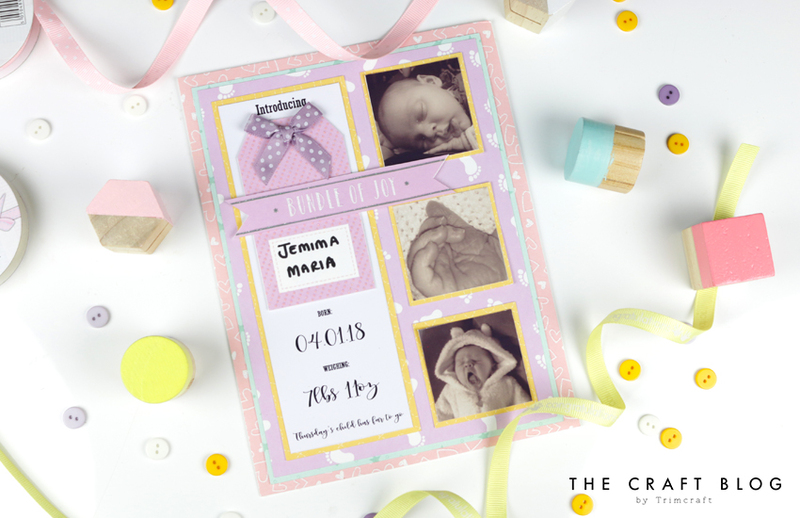 We’d LOVE to see your DIY Birth Announcement Cards, so don’t forget to #Trimcraft when uploading to social media and to share your projects in the Inspiration area.